Like most cell types, hepatocytes constantly produce extracellular vesicles (EVs) such as exosomes and microvesicles that are released into the circulation to transport signaling molecules and cellular waste. Circulating EVs are being vigorously explored as biomarkers of diseases and toxicities, including drug-induced liver injury (DILI). (c) the increases correlate well with classical measures of liver damage. 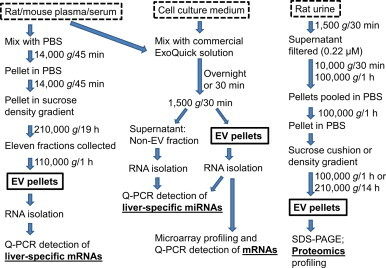 The expression profile of mRNAs in EVs and the compartmentalization of miRNAs within EVs or other blood fractions were found to be indicative of the offending drug involved in DILI, thus providing more informative assessment of liver injury than using alanine aminotransferase alone. EVs in the urine and cell culture medium were also found to contain proteins or mRNAs that were indicative of DILI. However, major improvements in EV isolation methods are needed for the discovery, evaluation, and quantification of possible DILI biomarkers in circulating EVs.